Later that summer, when Mrs. Penmark looked back and remembered, when she was caught up in despair so deep that she knew there was no way out, no solution whatever for the circumstances that encompassed her, it seemed to her that June seventh, the day of the Fern Grammar school picnic, was the day of her last happiness, for never since then had she known contentment or felt peace. She wiped her face with a damp towel, and in the silence, Christine said softly, "I know, I know so well." 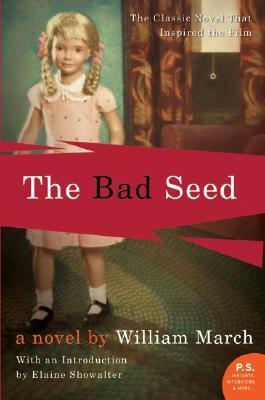 Synopsis of The Bad Seed by William March: What happens to ordinary families into whose midst a child serial killer is born? This is the question at the center of William March's classic thriller. After its initial publication in 1954, the book went on to become a million–copy bestseller, a wildly successful Broadway show, and a Warner Brothers film. The spine–tingling tale of little Rhoda Penmark had a tremendous impact on the thriller genre and generated a whole perdurable crop of creepy kids. Today, The Bad Seed remains a masterpiece of suspense that's as chilling, intelligent, and timely as ever before. Not sure what to think of this book which I happen to have on hand. I'm not much of a horror book reader but am willing to give this a try. Have you read this? Did you ever watch the movie?